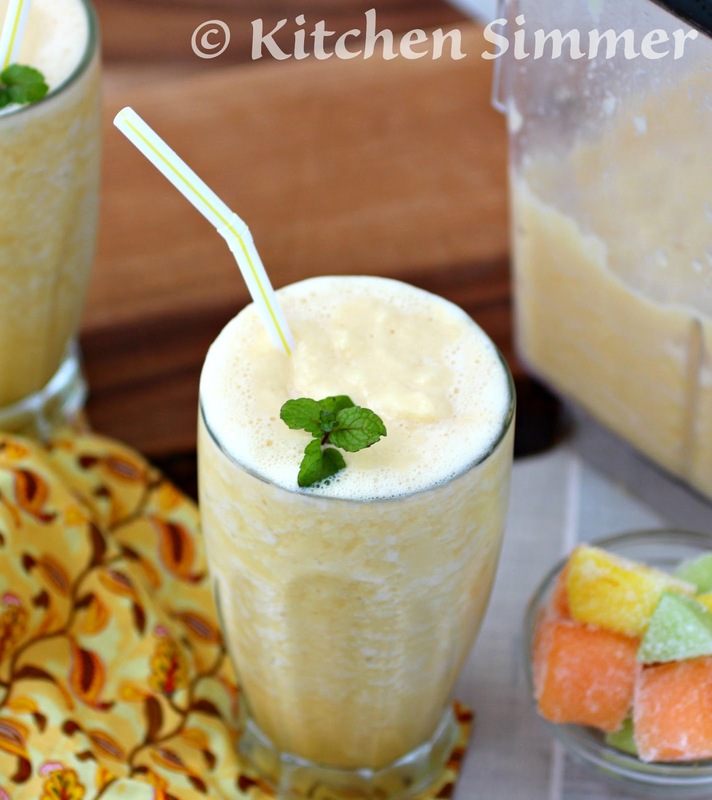 This Sunrise Smoothie is a wonderful breakfast smoothie that will have your smiling from the inside out. I decided to use some of the most popular breakfast time fruits like honey dew, cantaloupe, pineapple and orange juice. I also used low fat Greek yogurt to make the smoothie creamy and also add some much needed protein to the smoothie. The protein will keep you satisfied much longer than if the smoothie was straight fruit and juice. I have to actually confess the reason behind this smoothie. I used up the cantaloupe and honey dew that were not eaten out of a fruit platter that was served at a party. All the strawberries, watermelon and most of the pineapple were gone. The cantaloupe and the honey dew were hardly touched. So, instead of just leaving the fruit in the fridge in hopes that it got eaten, I immediately threw it into a Ziploc freezer bag and put in the freezer. I knew the fruit would make a great addition to any smoothie. So, when my son came across the frozen fruit in the freezer he asked me what kind of smoothie I could make with all these very popular breakfast time melons. 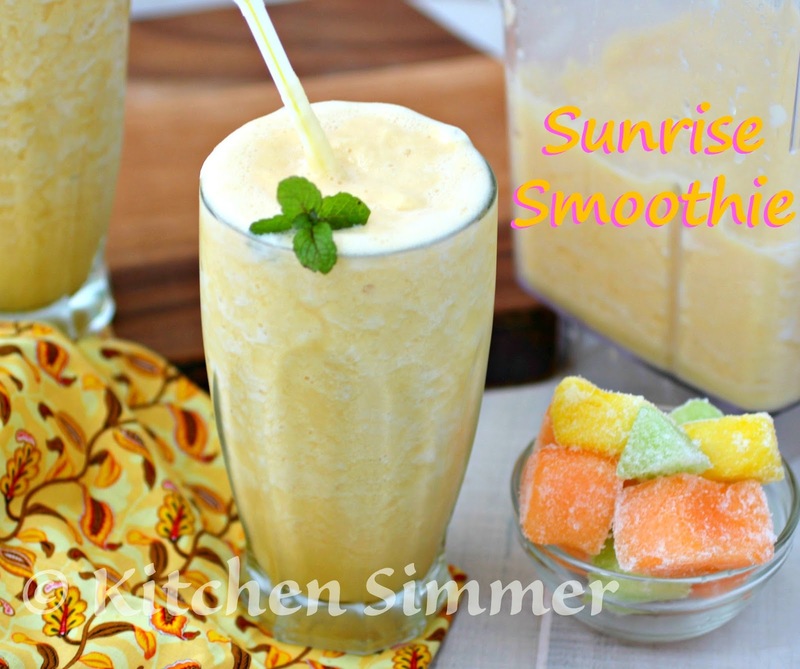 The idea of a Sunrise Smoothie immediately popped into my head and I knew that orange juice had to be the base of the smoothie. My son was not too excited about it because he was one of the reasons the honey dew and cantaloupe were not eaten from the fruit platter. After I blended it all up and served him a small glass to try it out... he was converted. He loved it. He actually loved it so much he drank a big glass next and then asked me to make more smoothie later. Hey, getting fruit and healthy Greek yogurt into my kids is my pleasure so cleaning out my blender twice in one day was not a problem. 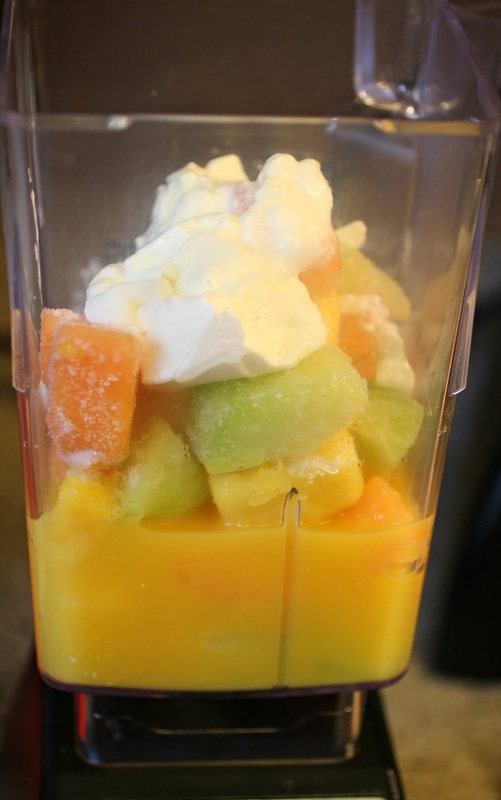 Place all ingredients in a blender and blend until smooth and frosty. Serve immediately and enjoy. 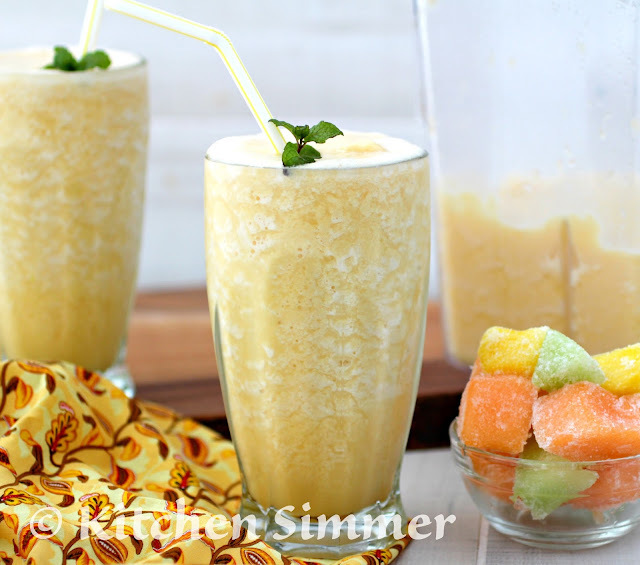 Note: I recommend that you freeze most of the fruit because that gives the smoothie a nice frosty texture and there is no need to add ice. Yum! I'm glad you added protein to it too, because that's totally something I'd do and I love that! Great save and this reminds me of summer! This sounds so good! I would love to start my morning with one of these smoothies!